If you have been looking for a cool seat cover that is understated and not too flashy, this is a great solution. 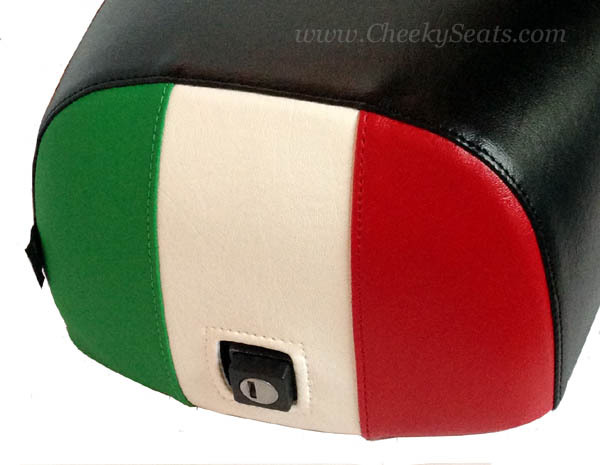 Our Italian Flag seat cover features the flag on just the back portion of the seat, the rest is tailored in our classic black! You are sure to turn heads with this elegant seat cover. 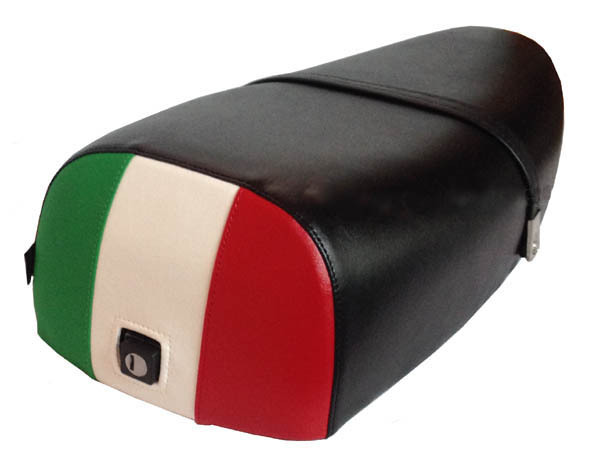 Our Italian Flag seat cover is waterproof and UV stabilized, it will stand up to years of serious use, full sun exposure, rain, snow, whatever you can throw at it! We also offer the option to upgrade to our premium matte black faux leather, a stunning fabric which has all the durability of our marine vinyl with a soft hand like calves leather. Click the above thumbnail to see the matte black cover. Please select above if you would like a matching passenger strap, we do add grommets to the side of the cover if you select this option. You will also need to use your own metal clips that are on the end of your current passenger strap, these are easily switched out.. Please select NONE if you have opted NOT to use a strap (some people prefer the look of no strap) so that we do not attach metal hole reinforcements (grommets) to the side of the seat cover (which are visible if no strap is used) If you would like to use your own strap, select the option for us to add grommets, which we will do at no extra cost.